I really feel like one day a year is not enough to enjoy turkey. So I invited some friends over and set out to make a post-thanksgiving turkey meal with some sides. Oddly enough, I think making all the sides was more laborious than the turkey itself. The turkey was so good and it's surprisingly pretty easy to make. There is prep work involved but once you stick it in the oven, you can pretty much forget about it. Preheat the oven to 325 degrees F. Drain any juices from the turkey and place it on a flat rack in a large, shallow roasting pan. Pat the turkey dry with paper towels. Working from the large cavity end, gently run your fingers between the skin and the meat to loosen the skin, taking care not to tear the skin. (Be careful not to do this with rings on your fingers!) Place the softened butter under the skin and gently massage the skin to spread the butter evenly over the whole breast. Susan did a great job massaging the turkey for me. Sprinkle the cavity generously with salt and pepper. Place half of the thyme sprigs in the cavity along with the onion and garlic. Tie the legs together with kitchen string and tie 1 length of string around the bird and the wings to keep the wings close to the body. Brush the turkey with olive oil, sprinkle with 2 teaspoons of salt and 1 teaspoon of pepper. 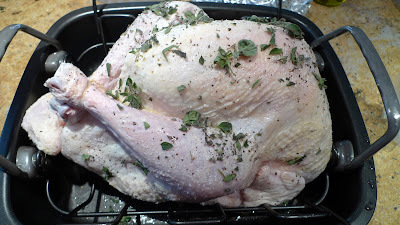 Remove 1 tablespoon of thyme leaves from the stems, chop them, and sprinkle on the turkey. Roast the turkey for 2 1/2 to 3 hours, until an instant-read thermometer placed in the center of the breast registers 160 degrees F. If you want the skin to be crisp, you don't need to keep basting the turkey. About halfway through, when the breast is golden brown, cover the breast loosely with aluminum foil to prevent the skin from burning. Remove from the oven, cover tightly with aluminum foil and allow to rest for 15 to 20 minutes. Carve and serve with the pan juices. Here's what our bird looked like. Pretty darn scrumptious looking, right? 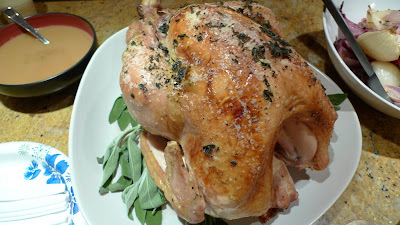 I know making roast turkey sounds intimidating, but it wasn't hard at all and it turned out great. This recipe is definitely a keeper.